It feels like this week has flew by without a blink of an eye. Even my son this morning, who always knows what day it is, was surprised it's already Friday. 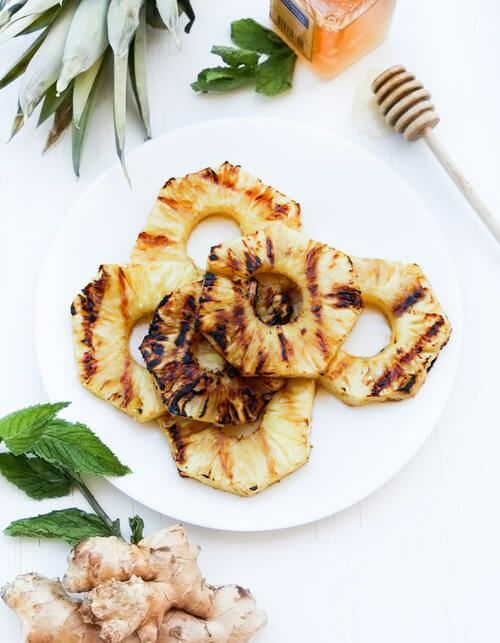 Sometimes we really do just need to pause and enjoy the fresh air, the people around us and this quick grilled sweet ginger pineapple. It's a refresher. Pineapples are great treat after a meal, especially if you feel bloated. This site here gives some great examples of the benefits of eating pineapples. Another health benefit I like in this recipe is in the ginger. The ginger is good for clearing up skin. Eating more of it also fights Alzheimer's disease and cancer. Last but not least, the honey is good for preventing infection. It fights the germs and bacteria in the body and promotes your health. Try this great tropical fruit with ginger and honey on a grill this summer, and don't forget to stop and relax with your loved ones. Peel and grate 1 inch ginger into a bowl. Mix with 4 tablespoons honey and 1 cup water. Place sliced pineapples into the ginger and honey bowl. Let it marinate for 15 minutes. Turn on your grill; on medium temperature grill the pineapple, 5-7 minutes each side.